Would you like to volunteer? 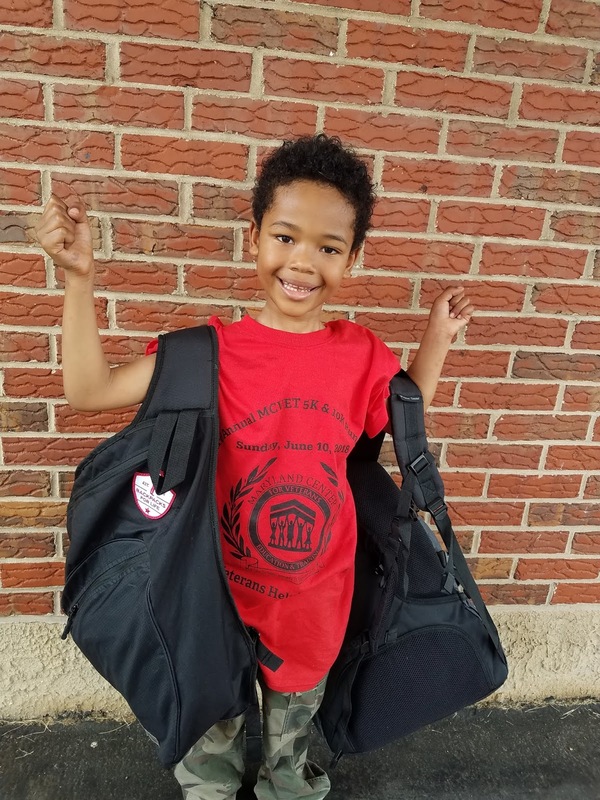 Youth are encouraged to give back to veterans! School has probably ended wherever you live. If you know a young person who would like to get involved in community service, I am looking for more youth to join my cause. 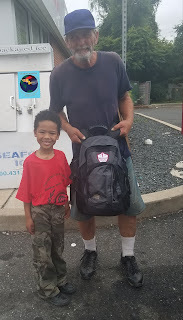 I will be hosting backpack packing party in a few weeks. I am happy that my first two youth volunteers will join me in Baltimore. If you want to thank veterans along with us, I am going to share ways you can get involved. Parents can get their children involved to help our heroes! https://www.gofundme.com/uxs2hbcs. 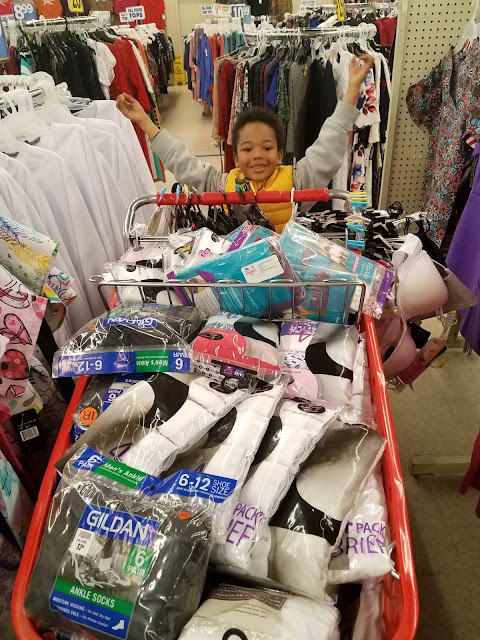 Ask people you know to donate at least $5 or donate a new item listed on the page where the first link is available. If you want to become a Give Back to Veterans ambassador, please let me know. You may help whenever you would like to raise awareness about the project. 2. Collect items for veterans. We always need a supply of gently used or new coats, scarves, gloves, t-shirts and shoes. Mail them, or arrange for them to be picked up, in the Baltimore area. They cannot be stained or have holes in them. New items are appreciated, too. I have a P.O. Box where items may be mailed. 3. 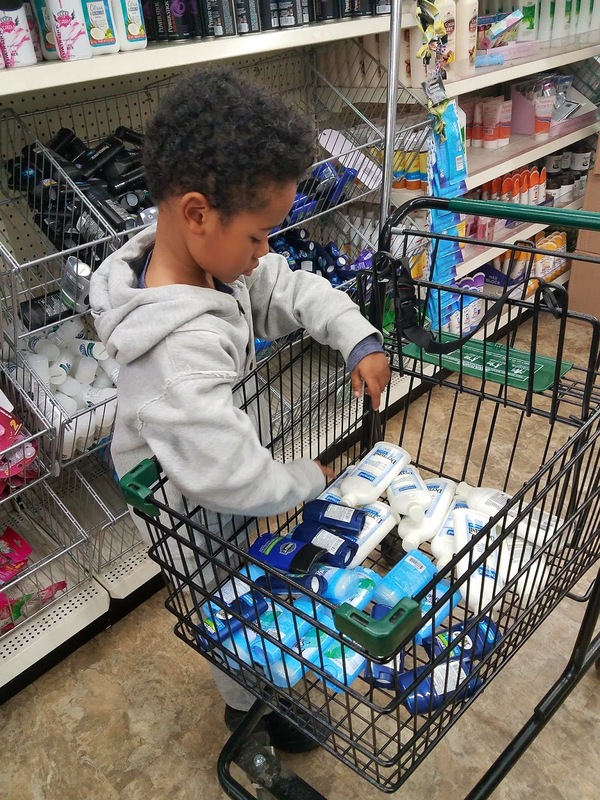 Host a hygiene kit donation drive in your school, office, or neighborhood. 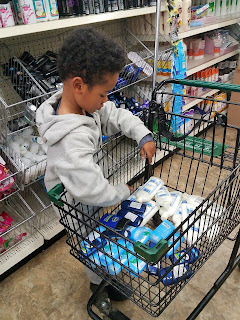 Hygiene items are listed on the donation page. 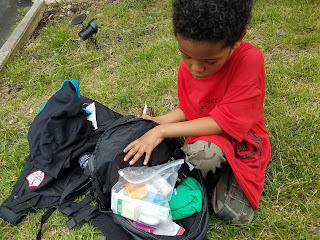 They are always needed to pack Hero Bags or deliver to MCVET in Baltimore. 4. Help spread the word. If you use social media, or you are willing to email information to a list of contacts, spreading the word about calls to action is always appreciated. 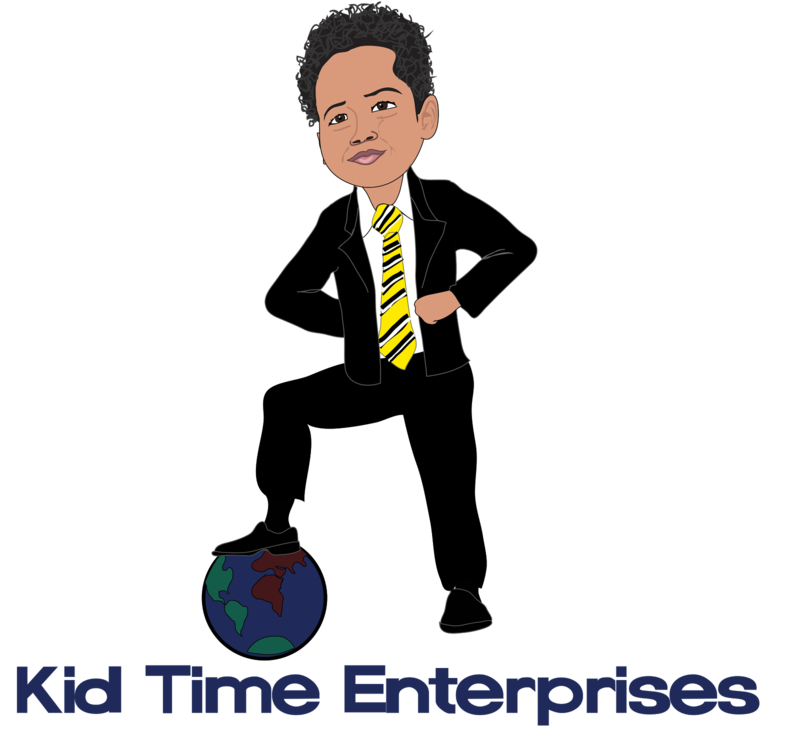 You may also like my page on Facebook via https://www.facebook.com/kidtimeenterprises/. Follow me on Instagram or Twitter. Please stay connected. Spreading awareness, and showing that you support veterans, helps to get more accomplished. 5. Buy any product on my website. I raise money as I sell my book or items. 6. Help connect me with stores or organizations. Do you have a contact who may sponsor items to stuff a Hero Bag or know someone who has items to donate? Please introduce them to my cause. 7. Find a local shelter or organization which helps veterans. Ask if they have a wish list. Donate whatever you can to them. If you decide not to join my cause, please consider supporting another project or organization. If you believe in the mission, get involved! 8. If you lead a youth organization, please consider creating a team building activity to learn more about veterans and why organizations like MCVET www.mcvet.org exists. 9. Also remember to support our troops who are serving our country by writing letters, sending care packages, or simply welcoming military families to your neighborhood or school by being kind to them. Many families move around the country. Teach youth to be friendly and help them to readjust to a new environment. 10. Spread kindness as often as you can. Talk to your children about being good citizens. Show them the way. 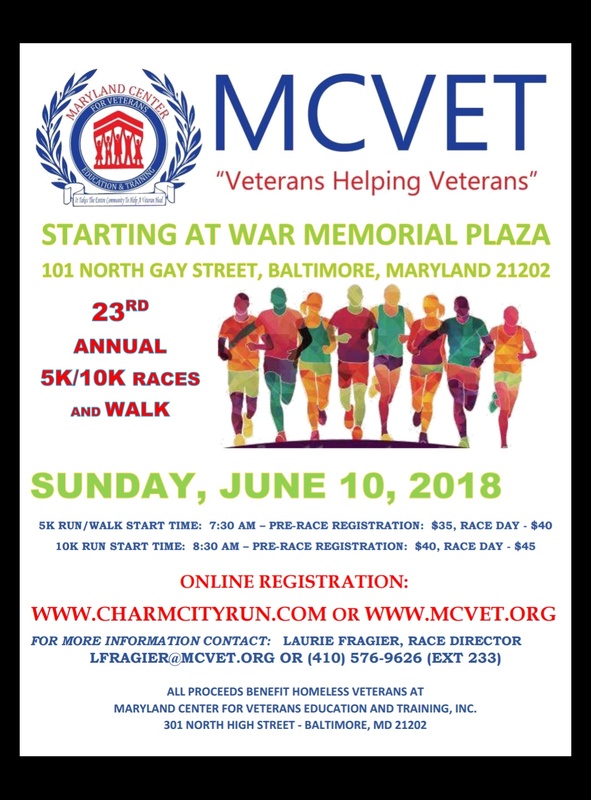 Will you run or walk in MCVET's 5K or 10K on 6/10? Let' s help veterans in need! 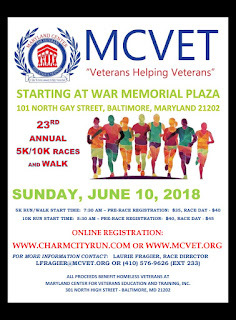 You may register for MCVET's 23rd Annual 5K/10K race on-site tomorrow. The fundraiser will be held rain or shine in Baltimore, Maryland. Visit www.mcvet.org for details. Thank you for supporting veterans in need!